The Historic Centre of São Luis has the largest and best preserved heritages of colonial Portuguese architecture of all Latin America. The first Europeans to see it were the French, in 1612, who intended to make it a French colony. They made a fort named São Luis ("Saint Louis"), after Saint Louis IX of France as a compliment to King Louis XIII. It was conquered for Portugal by Jerónimo de Albuquerque in 1615, leaving little time for the French to build a city. The core zone includes public buildings, sumptuous manor houses, marble multi-storey houses and small houses decorated with azulejos. In August 2018, I spent a couple of days in São Luís, the capital of the Brazilian state of Maranhão. São Luis was settled by France in the early 17th century, the only city founded by that country in Brazil, and occupied briefly by the Dutch before being conquered by the Portuguese in the middle of the 17th-century. The late 17th-century core of São Luís, where many of the buildings are covered with traditional azulejos tilework, is the best preserved Portuguese colonial city in Latin America, so no surprise it was added to the list of World Heritage Sites. 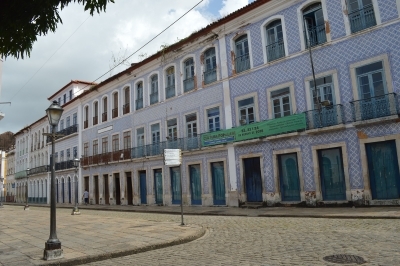 I have made three trips to Sao Luis and I have been able to explore the Historic Centre. The area is like a living time capsule in that the hand-painted tile and cobblestone streets have withstood the test of time. Perhaps best of all is the area continues to be full of life. It incorporates shops, restaurants, offices and living quarters. This affords a chance to fully engage the unique qualities of the area. I was in São Luís, capital of the State of Maranhão, for a weekend last August. Most tourists don't spend much time in São Luís, rather go as soon as possible to the nearby Lençóis Maranhenses, a paradisiac complex of fresh water lagoons formed on the dunes. Anyway, São Luís was the only city in Brazil founded by the French (hence named after the French King St.Louis IX), but very little of French heritage is left. The main attractions are the Government Palace, some historic museums and the "tiled buildings", designed with the purpose of isolating their interior from the intense heat (the city is close to the Equator). From all the 16 WHS I already visited in Brazil, this was the one I least wanted to go - it is far from São Paulo (a 3,5 hour-flight)and most buildings lack proper maintainance -, but I ended up enjoying. In any case, it is usually interesting to go to the least visited and off-the-beaten-track WHS. It's such a wonderful Island...I live there, but right now I'm an exchange student here in USA. There are attractions for all kinds of tastes. Great beaches. Good to surf, and play a lot of summer sports. Also one of the most famous place to sendboard. Very fun. It's very close to snowboard. The nights are perfect!!! A lot of night clubs, Bars, show houses, movies, theatres. 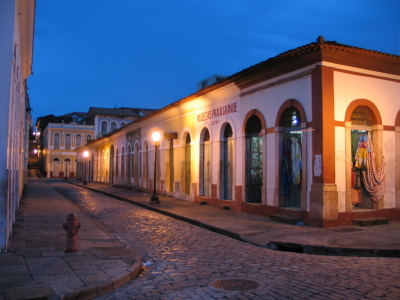 Sao luis is also a historical city. Downtown you can see old French and Portuguese buildings, and all kind of artcraft. Built or owned by French: In 1612 the French built a fort on the site of a "large village of the Tupinamba tribe" (Wiki) as part of the creation of the intended colony of France ?quinoxiale. Less than 4 years later it was taken by the Portuguese. Built or owned by Dutch: The Dutch captured it from Portugal in 1641 and stayed until 1645.